Ariel Joudai, CPA is a highly skilled New York, NY CPA firm offering innovative accounting services and tax planning solutions for business owners. Our mission is to remove financial obstacles and skillfully manage your tax obligations to improve your business and your bottom line. 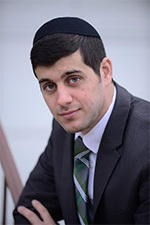 Ariel Joudai is a CPA with over 10 years of experience. He began his career at KPMG, LLP, as an auditor specializing in the real estate and insurance industries. He then shifted his focus to the private sector and began handling various aspects of the accounting department for a property management and a start-up construction company, before opening his own practice. Ariel received a Bachelor’s degree in Accounting from Binghamton University’s School of Management. He is a licensed Certified Public Accountant in New York and a member of the AICPA.